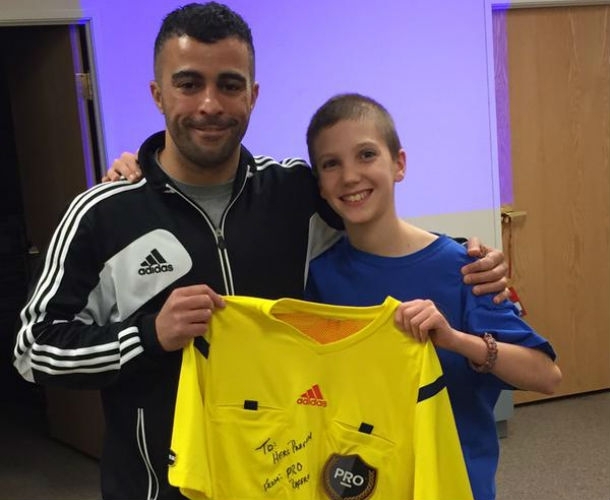 Alongside his role as a PRO official, Younes Marrakchi is a mentor group co-ordinator with Playthewhistle.com, a Colorado-based team that provides refereeing services to both youth and adult soccer programs. It was at a recent mentor session, on April 15th, instructed by former FIFA referee Esse Baharmast on the recent Offside clarification, where Marrakchi met a young boy by the name of Preston Kilzer. At the conclusion of the class, Preston approached both Esse and Younes to thank them for the talk and requested if they would sign some souvenirs and take pictures. It was the following day that Marrakchi discovered the remarkable story of the 12-year-old. “Preston is a first-year certified USSF Grade 8 referee and he’s doing a great job – receiving wonderful compliments from mentors, coaches and fellow referees. Preston was diagnosed with third stage Hodgkin lymphoma when he was five years old but he bravely fought the disease, winning the battle ahead of his sixth birthday, and he is now cancer-free and thriving. “After hearing Preston’s great story and learning a little bit more about him, I decided to – at the next Playthewhistle mentor session two weeks later – present him with a small gift from all of the referees and staff at PRO,” Marrakchi, who has officiated in MLS and NASL this year, added. “So, as encouragement and for the great job Preston is doing on and off the field, I signed a jersey to ‘Hero Preston’ from PRO referees. Preston was taken by complete surprise and was very gracious. The smile on his face was priceless. Preston was recently on NBC News for being part of the largest Pediatric Cancer Fundraiser in the world – St. Baldrick’s Fados – where they raised over $500,000 towards a cure. Preston said: “I love the game of soccer. Since my school team doesn’t play during the Spring, I wanted to find another way to keep myself involved with soccer, start saving money, and continue to learn how to work with others. Maybe, in years to come, PRO might just be seeing the name of Preston Kilzer added to the roster.